Newcastle based property specialist, All Saints Living, is to undertake the development of one of the city’s tallest buildings. Acknowledged by planners to have an elegant, landmark architectural style, the 82 metre high structure – in Rutherford Street, off St James’ Boulevard – recently received planning approval. When completed the 26 storey building will comprise 162 private rented sector (PRS) apartments, providing homes for up to 456 people, anticipated to be young professionals, post graduate students and those working in the adjacent Science Central and university hospitals. Like similar, £80 million, 423 apartment projects which All Saints Living is developing in Warrington and Milton Keynes, the Rutherford Street initiative presents an attractive investment opportunity. The off plan sale of 96 single and 66 twin bedroomed apartments will begin within the next few weeks. All Saints Living is a division of the Newcastle headquartered High Street Group – a multi-disciplinary operation established 10 years ago and involved in property investment, development finance and financial claims. “We are delighted to be playing such a vital role in what will be a landmark development in the North East. It represents a £40 million investment in Newcastle and is expected to create up to 400 direct and supply chain jobs, through a structured training and employment management plan. In addition, it will provide an attractive investment opportunity, with yields of up to 6 per cent, that would bring further capital to the city to support economic growth. “Around a sixth of the UK’s population lives in privately rented accommodation and this is forecast to grow. The private rented sector (PRS) in the UK has, until now, been predominantly individual properties marketed through estate agents. However, institutional PRS in developments such as this one is now becoming more evident. Planning consultancy DPP and architects Faulkner Browns developed the original application, which involves the demolition of a semi-derelict warehouse to make way for the building. The masonry and glazing façade at the lower level will blend with the existing streetscape and reflect the grade II listed print works building opposite. At the upper levels, a more vertical style, with steps and cantilevers, will make a real architectural statement. As part of the planning consent it was also agreed that up to £500,000 would be invested in the surrounding street scapes to upgrade the walkways and signage in the old town walls area. A further £700,000 will be made available for affordable housing elsewhere in the city. In addition, public viewing from the rooftop – offering panoramic views of the city and even as far as the coast – will be available 18 times each year. Other All Saints projects driving rapid growth of the business include proposals for a new 90 bedroomed hotel in Durham City, the creation of the 32 bedroomed Hotel 52 and Loca restaurant in Whitley Bay, 25 executive homes in Hartlepool and the redevelopment of the Gosforth walled gardens, adjacent to Newcastle Racecourse, into 14 executive homes. In Scotland there are plans to create 18 apartments in a converted and extended school, with nine large detached homes in grounds in the Glasgow area and 12 more apartments in a converted and extended listed mansion house up the coast at Helensburgh. 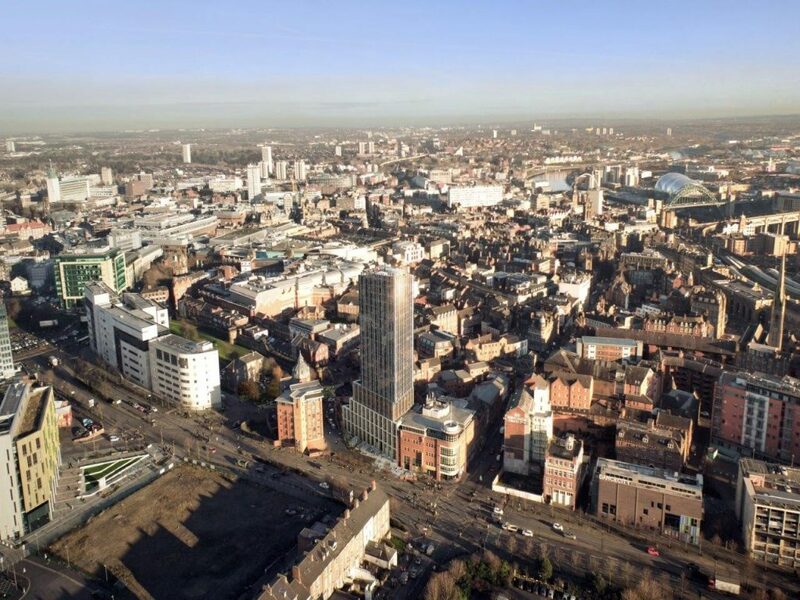 Details of the North West, South Yorkshire and South East projects have yet to be released but similar to the Newcastle initiative, will involve developing apartments for private rent. With its headquarters in St. Cuthbert House, Newcastle, The High Street Group was established by successful entrepreneur Gary Forrest in 2004. It has grown to become a leading financial and property group employing over 50 people in activities including property development, developer finance and financial claims.